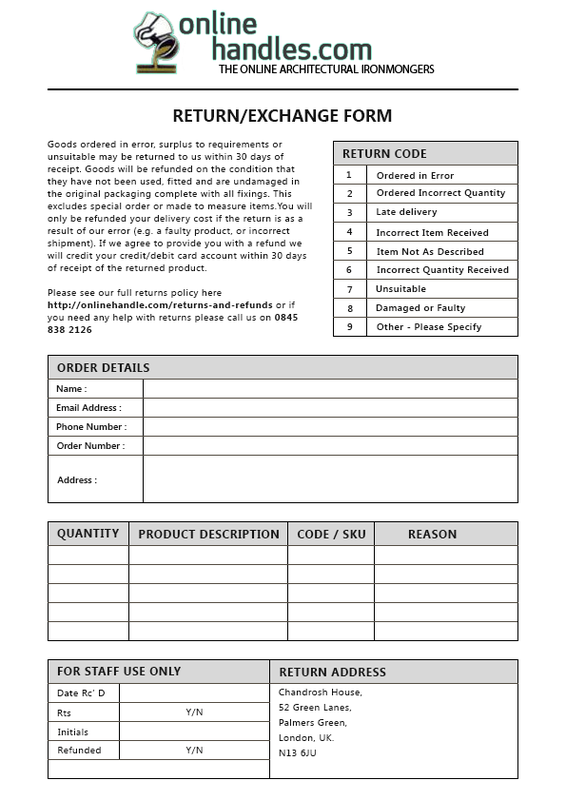 All items returned for exchange or refund must be accompanied with a copy of the original receipt of purchase. Goods returned for refund must be in their original packaging and unused. Returning of items is the responsibility of the customer who is liable for the cost of returns and must first obtain authorisation to return goods ,and a returns note number by e-mailing us at sales@onlinehandles.com. Providing the goods are returned to us within 21 days of you placing the order with us, and that they have not been used or fitted and they are undamaged in the original packaging. You will only be refunded your delivery cost if the return is as a result of our error (e.g. a faulty product, or a incorrect shipment). If we agree to provide you with a refund we will credit your credit/debit card account within 30 days of receipt of the returned product . Any Goods which are surplus to requirements will be subject to a restocking charge of 20% from date of purchase. Goods supplied in error from us a full credit will be issued. Non-stock items, which have been specially ordered, will not be restocked under no circumstances. Products in our Light Switches & Sockets, UPVC Door Handles, Porcelain Door Handles On Rose and Porcelain Door Handles On Backplate sections are made or assembled to order and therefore classed as 'Special Orders' and cannot be Returned. Fabricated goods cannot be returned unless they are proved to be faulty. The Company shall be under no liability for any delays loss or damage caused wholly or in part by Act of God by any act done or not done pursuant to a trade dispute, whether such dispute involves the Company’s servants or not or any other cause beyond the reasonable control of the Company. The Company/Contract shall be subject to the Laws of England. Intellectual property including certain images, design, layout and descriptive text appearing on this website www.onlinehandles.com is the copyright of onlinehandles Ltd and must not be copied or reproduced in any medium without licence. If you require any further information on permitted use, or a licence to use any material, email us admin@onlinehandles.com or Tel: 0845-838 2126.